1. It is said that first impressions are more lasting than subsequent ones. In bonsai this first impression is created by the Nebari or Surface roots. Strong nebari gives the impression of a strong bonsai and vice versa. The relationship of surface roots with the trunk from the base up decides the impact of the bonsai and, in a manner of speaking sets the pace of the entire composition. 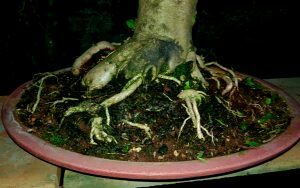 Good surface roots which indicates stability and good anchorage (in the soil), although it is the first requirement of a good bonsai, also needs to compliment for the movement of the trunk and the supporting branch silhouette. This is comparable to the position of a batsmans’ feet while playing a particular cricketing shot; if the footwork is at fault, the shot is not executed correctly and lacking the requisite power behind it, does not achieve the desired results. 3. In the case of upright styles with slanted or twisted trunks (Slanting, Informal Upright, Windswept styles) although the surface roots would radiate in all directions they would be tortuous & snaky and with unequal thicknesses. Where the trunk leans in a particular direction, the major visible root/s on the side opposite the lean will appear to be stronger but expressing a tension as if counter – balancing the pull of the lean; the root/s on the side of the lean, on the other hand will appear sprung as if compressed to support the visual mass of the branches and foliage. The design of the bonsai, in the curves of the trunk and the springy sweep of the branches would be but a reflection of the tension and compression of the surface roots; only this will lend conviction and strength to the overall composition. Sometimes the effect is exaggerated by exposed roots which coil sinuously under the trunk like the legs of a prehistoric monster. 4. 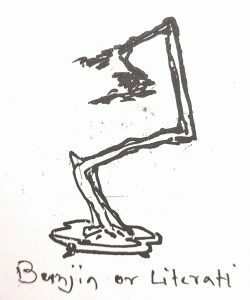 In the case of Bunjin, Cascade and Semi-cascade styles, the roots will appear more compressed, given the narrower mouth of the pot, although the roots opposite the direction of the lean of the bunjin style or cascading trunk might just appear to be stronger to counteract the lean or fall of the trunk. 5. In both, the informal styles and the cascading styles, the twisting appearance of the roots is therefore both functional as well as artistic. A critical design balance is achieved through this impression of the nebari or surface roots. This aspect is succinctly expressed thus by Carl Bergstrom, USA, ” the logical explanation …. 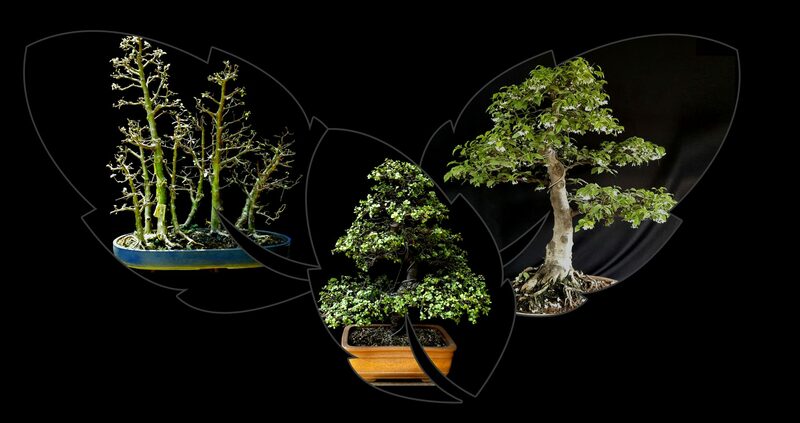 of the structure (of a bonsai) must be consistent in both a physical sense and in an artistic sense. Tension requires must be consistent in both a physical sense and in an artistic sense. Tension requires obedience (?) and compression requires release. 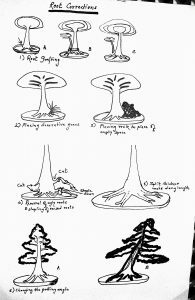 How these dynamics are accounted for in the overall design is how we must measure the success or failure of the root configuration of a bonsai”. It is difficult to obtain plants with ideally arranged roots. More often than not one gets plants with defective rootage only, especially if the plant is a collected one. 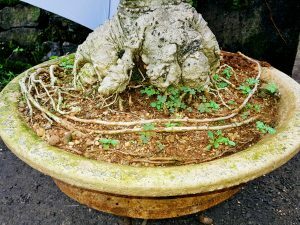 Most times, if a bonsai is to be created out of nursery grown material, the chances are that the roots will be abundant but it will probably take years to develop good surface roots compatible to the style in which the bonsai is designed. This is usually done by exposing the surface roots a little more during each successive repotting. 7. Corrections to defects in nebari: The defects in nebari are usually in the form of: a) lack of roots at certain points; b) poor or thin rootage; c) abnormal roots or too thick roots. In such cases, corrective measures need to be adopted in order to maintain the impression of a particular style. 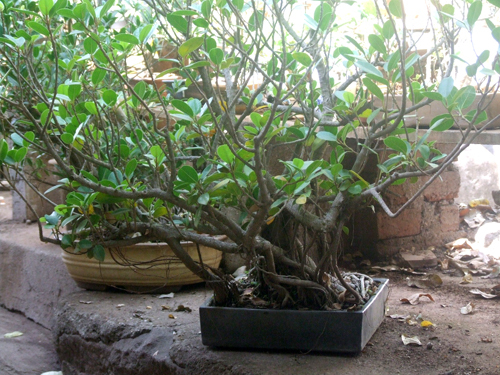 For trunks lacking rootage from certain points – initially attempts should be made to encourage new roots by making cuts at the places de void of roots and dusting these places with rooting hormones or if that fails or if the variety is hard to root, root correction in the form of grafting the roots of a donor plant or grafting a donor plant at a place devoid of roots should be tried. If even then roots fail to emerge, then a rock or a tuft of decorative grass can be placed at the point lacking rootage. Poor rootage can also be corrected in the same way. 8. Abnormal as also hanging roots should be removed entirely if substitute roots are already available at suitable places lower down. Alternatively, they can be stapled down or in extreme circumstances wired into the desired shape. Overly thick roots can be split along their lengths and the resultant wounds sealed with a suitable sealant. 9. In some cases, lack of rootage can be corrected by changing the potting angle and modifying the branch structure and opening up the foliage wherever necessary to suit the new design. 10. However, in a case where roots are misshapen beyond salvage or only a single heavy root exists, the trunk just above the soil surface can be gouged or scoured in selected placed, rooting hormones applied in these places and the trunk at ground level is enveloped in a wall or well of netting and the space is filled with coarse sand or well-drained soil and watered well; the well can be gradually removed when new roots emerge and are strong enough to replace the old roots. 11. The caliper growth of thin or weak but ideally placed surface roots can be hastened by leading them into hollow plastic or bamboo pipes or tubes filled with gr owing media (soil and compost in equal proportions) which are in turn led into the ground. But this is an advanced technique that has to be tried on bonsai which are already in a mature stage. 12. 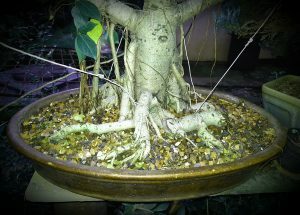 To sum up, since nebari or visible surface roots are the basis on which the other elements viz., the trunk, branches and foliage depends for the impression of a convincingly mature image in bonsai, it is important that particular attention needs to be paid to their development and artistic arrangement in the bonsai pot, failing which the bonsai, however developed it may be, will not make the intended visual impact and style statement. 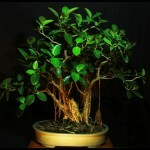 Following are some photos of the nebaris of some of my own bonsai. Each nebari pic is followed by the actual tree in order to show the relationship between the surface roots and the style of the tree. Admittedly, most of them still need a lot of refinement, but that is the beauty of cultivating bonsai: they are never finished and therefore of constant interest and joy in their changing imagery. Baobab (Adansonia Digitata) nebari photo on the left. Same tree full view on right. 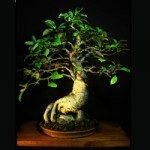 2 – “Artistic Composition and the Position of an Asymmetrical Nebari” by Carl Bergstrom, USA, in the Art of Bonsai website, 2012. 3 – Occasional Critiques by Robert Stevens on the Stone Lantern blog. 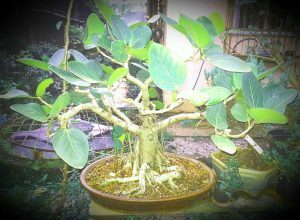 4 – My researches and my article entitled “Perceptions & Perspectives in Bonsai Design” on my own website “ruchabonsai.com “. 4)	Bougainvillea should be defoliated to induce better branching during the growing period. 4] For most tropical flowering and fruiting plants, 2/3 weekly doses of Phosphorus dominant fertilizers about a month before the flowering /fruiting season of the species will induce better and sustained flowering. It is generally known that almost all plant varieties need ambient light conditions and a certain amount of warmth & humidity for good growth. Climatic conditions are not the same throughout the world; they differ depending on the latitude in which the region is located. There are broadly two climatic zones in the world, viz., tropical (hot), temperate (very cold). Regions in the vicinity of the north or south poles are said to be in the temperate zone and experience extremely cold or near freezing climate almost throughout the year. Regions located around the Equator (tropical regions) have extremely hot climate throughout the year, hotter than all the other regions of the world due to the directness of the sun rays. Between these two extremes, are climatic conditions which vary from the cold to the hot to a greater or lesser extent, depending upon which latitude the region is located in. The nearer a region is to the north or south pole, i.e., between the Tropic of Cancer or Tropic of Capricorn and the respective pole and further away from the equator the more semi-temperate (more cold, less hot) the climate will be; conversely, the nearer a region is to the Equator, further away from either of the poles but between the Tropic of Cancer or Tropic of Capricorn and the equator, the more semi-tropical (more hot, less cold) its climate will be. Growing conditions are accordingly, significantly different in all these climatic zones, but sunlight, temperature and humidity play a very important role in the growth cycle of plants in general and bonsai in particular in the tropical belt and semi-tropical regions. The scope of this article is confined to the consideration of the growing conditions in the tropical and semi-tropical belts, i.e., between the Tropics of Cancer and Capricorn, as this is the region I am most familiar with. The tropical regions, both the tropical belt around the equator and the semi-tropical regions between the Tropic of Cancer or Tropic of Capricorn have four seasons: winter (January–February), summer (March–May), a monsoon (rainy) season (June–September) and a post-monsoon period (October–December). In the tropical belt, i.e., between the Tropic of Cancer or Tropic of Capricorn, in the regions around the equator, the sun rays fall perpendicularly on the surface of the earth so that the intensity of sun-light is extremely high and average temperature varies from about 28 degrees Celsius to maximum 50 degrees Celsius. The length of the day is also very long, ranging from 9 hours a day in winter to around 12 hours a day in the height of summer. Rainfall in the tropical belt is perennial, i.e., it falls intermittently throughout the year due to accelerated evaporation caused by high temperatures,. This results in year-round growth of most of the plants due to higher humidity and consequently gives rise to some of the best tropical rain forests of the world. (there are temperate rain forests too). 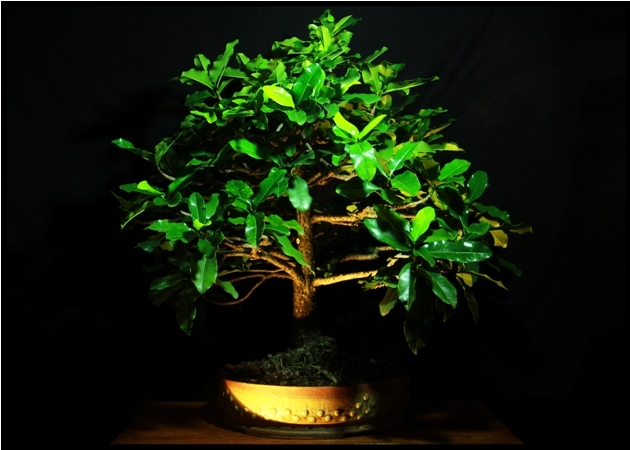 Bonsai too would have equally good growth due to the high humidity and temperature. In semi-tropical (more hot, less cold) regions, the same conditions and seasons prevail except that the intensity of the sun is lesser than in the tropical belt due to the obliqueness of the sun rays falling on the surface of the earth. (The farther away from the equatorial region, the more oblique are the sun rays hitting the earth and consequently the lower the temperature). The length of daylight is also lessened comparatively. 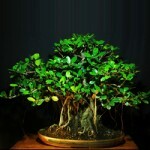 But otherwise the growing conditions for plants and bonsai are virtually the same. In most regions there is a prevalence of a season of heavy rainfall resulting in high atmospheric humidity followed by winter which is not very severe and summer in which it can get stiflingly dry & hot. The climatic conditions favor good growth of plants. In both the cases there is a very short period of winter dormancy and also sun-light is available more-or less through-out the year. So, most of the varieties of plants which survive well in higher temperatures, tolerate higher sunlight conditions for long periods and do not require a dormant period can be grown easily and successfully as bonsai. Evergreen broad leaf varieties, deciduous broad leafs, succulents & arid region plants as also some coniferous evergreens which do not require a significant winter dormancy and require good sunlight & humidity do extremely well as bonsai in the tropics. The second important factor is that root activity is faster in warmer soil temperatures compared to colder soil temperatures. It is for this reason that bonsai which are grown in temperate zones have only one annual growth cycle in spring due to its warmth, whereas there are three distinct warm periods in the tropics and consequently three definite periods for good root activity – the spring (about 2 months), the alternate showers & sunlight which provides humidity in monsoons (3 months) and the pre-winter heat (15 days-1 month); this means that the plants are also in high active growth during these three periods, apart from the regular growth due to the generally warm weather throughout the year. Plant varieties which require high temperatures & humidity would naturally thrive very well in tropical climates. Due to the size of their leaves, broad leaf evergreen varieties are able to generate carbohydrates at a higher rate than the coniferous evergreens and therefore growth in broad leaf evergreens is observed throughout the year and regeneration is also speedier. 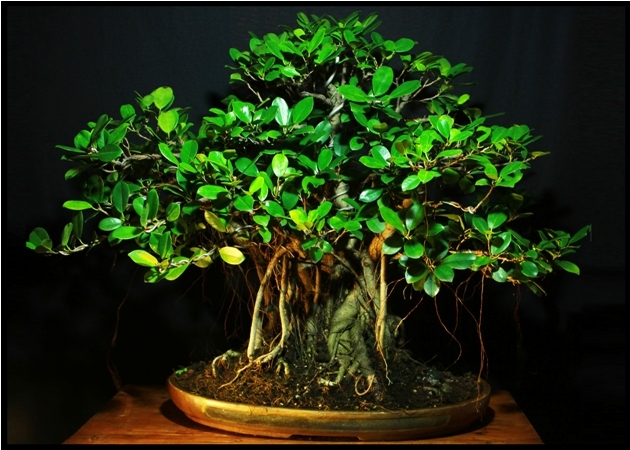 Ficus especially are prone to form buttress roots and also profuse aerial roots. 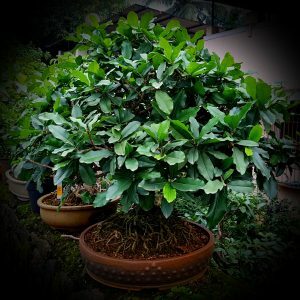 The availability of ambient sun light and humidity ensures that most of these varieties are successful as bonsai in tropical climates and can also be placed in full sun light throughout the year. 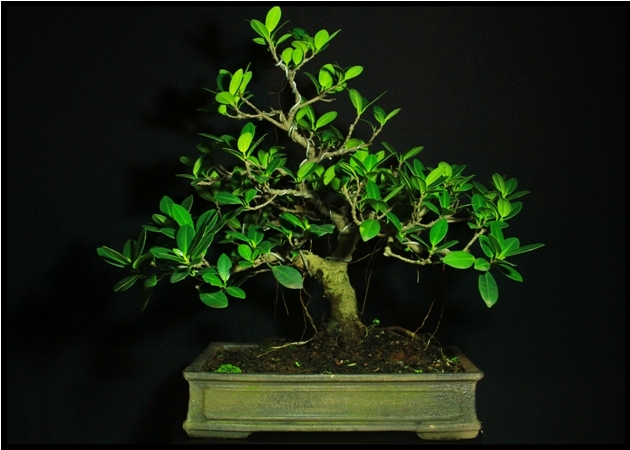 Nevertheless, others varieties which are basically temperate climate plants but require good sunlight also thrive as bonsai in these conditions due to the presence of high humidity. Conifers, especially many sub-varieties of junipers (e.g., L Juniperus Prostrata, Africans, etc.) which proverbially grow only once annually or at best in spurts in temperate zones and become dormant in the winter are observed to register noticeable growth even in the mild winters of the tropical climates due to good humidity and light conditions and will do well in the hot summers, provided those which are likely to scorch or get stressed in the severe mid-day sunlight in the height of summer are given some over-head protection. Some deciduous plant varieties (those which shed all their leaves almost at once in the autumn), basically of temperate origin (e.g., Chinese Elm, L Ulmus Parviflora) develop into evergreen / semi-evergreen plants if they are located for a long time or for a few generations in the tropical / semi-tropical regions. This is apparently the result of the heat and humidity. Excellent results are evident in the case of most Figs (L. Ficus species), Adenium (L. Adenium Obesum), Jade (L. Portulacaria Afra), Wax (L. Carmona Microphylla), Wrightia (L. Wrightia Religiosa), Jasmine Orange (L. Murraya Exotica), Casuriana (L. Casuriana Equisetifolia)and some other tropical varieties, including foliage, flowering and fruiting plants. Figs (L. Ficus species), at least some varieties, may tolerate slightly low light conditions, but most do better in good direct sunlight. Growth in direct sunlight is always healthy, more compact with lesser inter-nodal distances and a denser and bushier growth. 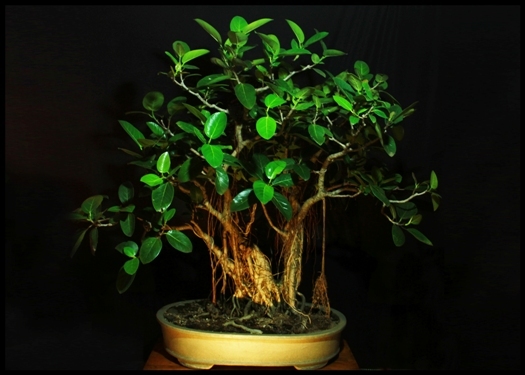 Humidity will encourage aerial roots which are a main feature and attraction of ficus bonsai. Adenium (L. Adenium Obesum), which is basically an arid region plant, needs maximum sunlight but do not really need humidity. The hotter the climate, the better is the flowering on adeniums. They can survive less or infrequent watering also. Wax (L. Carmona Microphylla) also needs good sunlight for tight compact foliage and good flowering but requires more watering and more frequently. Needs constant trimming. Wrightia (L. Wrightia Religiosa) requires good sunlight for flowering, although in some climates, it tends to shed leaves if in cold weather. Leaves may turn a dull yellow en masse, in extreme sunlight. Jasmine Orange (L. Murraya Exotica or Paniculata)also requires good sunlight for flowering. However extreme sunlight stresses the plant resulting in yellowing of leaves in summer. Casuriana (L. Casuriana Equisetifolia) also thrives well in good sunlight but requires humidity. Occasional spraying with salty water has a beneficial effect on the plants as they are mainly seen to grow well along sea shores. Due to year-round growth, almost all tropical plants & bonsai need to be fertilized accordingly. There is hardly any dormancy even in the case of deciduous trees so fertilization need not be stopped on that account as is the practice in temperate regions. Nitrogen is also needed in higher doses than is required for conifers and other temperate trees. In the temperate zones, as natural temperatures are significantly lower than tropical regions, the hot and humid conditions of tropical zones will have to be simulated artificially, if tropical varieties of plants are to survive, let alone grow successfully. Hot house or green house with artificial indoor lighting and heat & humidity can be installed to re-create tropical conditions but they are expensive. But green houses are largely extensions of the main house and depending upon the number of trees and their sizes may need quite a bit of space and are worthwhile for growing medium to large size bonsai. Mame & shohin bonsai can also be grown indoors without the need for green houses if there is central heating in the house and will thrive well provided ambient light and temperature are maintained; if mame bonsai are grown more trees can be kept in lesser space. However, due to lesser intensity than natural light in the tropics, the duration of artificial lighting needs to be greater, approximately 12 – 16 hours if the trees are to remain healthy. Specialized halide lights are more suitable for green house conditions but they are expensive and may need periodic replacement with new lamps to maintain light intensity; halogen lamps are equally good for light intensity but heat up too much. Small trees can be grown indoors under florescent tube lights but the trees will have to be placed very near the light source. And the light fixtures may not look decorative too and have to be replaced periodically. Frequency and potency of feeding fertilizers also needs to be on a reduced and lesser scale. It is certainly possible to grow tropical subjects successfully under indoor light conditions in temperate zones, provided proper growing conditions are maintained and adequate precautions are taken. a) Good draining capacity: The draining capacity of the bonsai soil is gauged by its capacity to allow excess water to escape as fast as possible from force of gravity so that, given an equable climate (not too hot nor freezing cold), the soil goes from a state of wetness or sogginess immediately after watering to a state of mildly moist between a given watering cycle, presumably of twenty four hours. Good drainage in turn depends directly on the particle size and its tensile strength. The bigger the particle size, the better the spaces available for aeration, lesser surface tension & better gravitational drainage; the smaller the particle size, the lesser the spaces available for aeration, the higher is the surface tension & consequently poorer gravitational drainage. In the event of poor drainage the roots cannot absorb enough oxygen and consequently due to anaerobic respiration they produce ethanol which causes root rot and cause poor growth of the plant and eventual death in the event of continuance of the water logging. b) Tensile strength and size of soil particles: The particles of the soil need to be of a tensile strength which will resist crumbling under pressure, friction or changes in temperature. The absence of granular ingredients of good tensile strength would result in gradual pulverisation & compaction of the soil particles and lessening of its draining capacity due to reduction in particle size over a period of time. This state is referred to as structural breakdown of the soil. Material such as river sand, stone crush, brick crush, calcined clay, etc., have good tensile strength and therefore good drainage capacity. c) Cation Exchange Capacity (CEC): CEC refers to the capacity of the growing medium to retain nutrition and fertilizers and make them available to the plant. Water and nutrition absorbing capacity is present in some components such as clay, humus, diatomaceous earth, pumice, etc. However, clay, unless calcined or roasted, tends to crumble rather easily and particles will eventually find their way to the bottom of the pot causing a build-up of sedimentation which will hamper drainage, mostly sooner than later. Humus, on the other hand, as it is composed to organic animal or fauna waste, will not crumble so much and due to natural adhesion will also not easily sedimantate at the bottom of the pot. For the reasons stated above, the use of clay is not advisable in the long run. As to sand, since it is generally inert, it will practically have nil CEC. Diatomite, pumice, crushed brick, calcined clay, etc, due to their semi-absorbent capacity have a good CEC and will be able to substitute clay as they are less prone to compaction. d) Ph factor: Refers to the acidity and alkalinity of soil and its ingredients. For most plants a soil with a neutral ph works well for optimal growth of the plants. Where specific species need a different ph level, additives will be required to be used periodically. All soils will gradually become progressively more acidic due to the use of chemicals. To reduce the acidity and to increase alkalinity, lime (calcium) is added to the soil as required. e) Inertia or Chemical reactivity: The reaction of the ingredients of soil to changes in temperature extremes may not be significant in the tropics but in temperate climates where freezing temperatures are prevalent it may affect the drainage to the extent that in freezing temperatures the soil would solidify through contraction and hamper drainage and is also likely to damage fine feeder roots. Of course, in such climatic conditions, it is highly probable that the frequency of watering may be very low and hence the chances of freezing in the soil might be avoided. The chemical reactions of the various ingredients of soil viz., sand, clay, humus, diatomite, pumice, crushed bricks, etc.,to fertilisers/reagents, etc., is practically neutral and hence it is not harmful per se. However, due to the semi-absorbent nature of these ingredients (except sand which is inert), these ingredients may have a build-up of acidity over a period of time and soils having a large proportion of these ingredients will have to be treated for acidity. For most plants which are grown in ordinary garden pots (made of clay or plastic or composite materials) the growing medium or soil consists of a simple formula of equal proportions by volume of unsieved garden earth and compost or manure. Due to its vertical shape a garden pot holds a substantial amount of the growing medium, so this formula or slight variations thereof work well for a long period of time. Even if the structure of the particles break down, due to the height of the pot the sedimentation at the bottom of the pot is not a problem for drainage over a long period of time if broken shards of earthen pots are placed at the bottom of the pot. 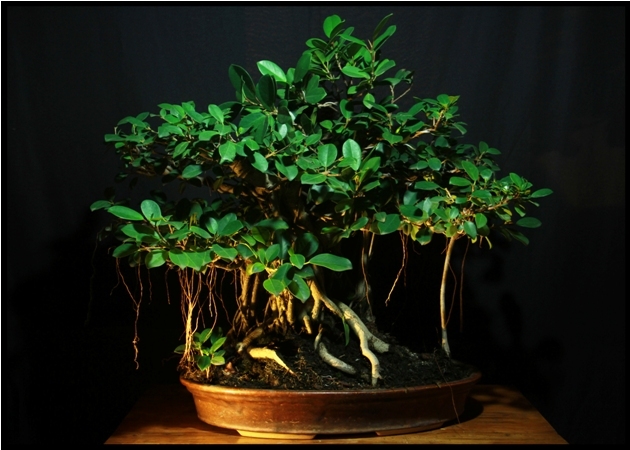 However, the environment of a bonsai is limited to the soil holding capacity of a generally flat pot which is significantly smaller than garden pots, so the soil needs to be composed of lerge particles of ingredients that have an open structure of soil which allow good aeration for good root growth & good drainage and should be heavy enough to support the weight of the bonsai and should also be able to absorb and provide nutrition for optimum good health of the bonsai. Horizontal drainage in bonsai pots is also much slower than in garden pots. If ingredients with fine particles of soil are used, water-logging or prolonged sogginess of the soil due to poor soil aeration and poor drainage will result in root –rot due to the production of ethanol through anaerobic bacteria which germinates quickly in compacted soils. In such small pots, corrective action such as emergency repotting is usually late, i.e., at a time when root damage is in its extreme stage and almost irreversible. 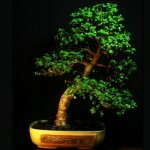 The importance of soil in bonsai therefore cannot be overemphasised. It is the singlemost crucial factor on which hinges the success or failure to grow healthy bonsai. 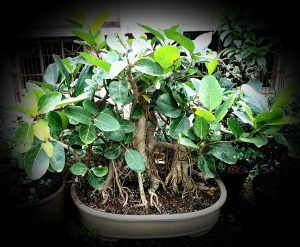 In order to find the perfect formula for bonsai soil, bonsai growers have experimented with all kinds of local material including pulverised pine bark, saw-dust, coco-peat, city-waste, wood-chips, plastic chips, earthen pot crush, etc., using these as additives and in some cases directly as soil – substitutes. Based on experience, climatic conditions and watering practices, etc., each bonsai grower has formed his own recipe of the soil mix and due to the success attending individual circumstances, claims to have found the perfect formula of bonsai soil. However, given the diverse climatic conditions, plant species, watering practices, etc., it is difficult to rely on a single or fail-proof formula for a rigid proportion of the ingredients or a fixed recipe thereof. Proportion of the soil components / ingredients will necessarily depend rather heavily on these factors and will accordingly vary between individual bonsai growers and also region to region based on availability of local materials. The components of the growing medium or soil for bonsai are therefore necessarily a selective mixture of different ingredients such as sand, clay, humus, diatomite, pumice, crushed bricks, etc., which provide drainage, anchorage and also water and nourishment to the plants. A good bonsai soil should include a large proportion of granular sand or something similar in nature & structure and well-rotted manure, humus and common garden earth in such a proportion that the soil will not only be able to provide moisture & nourishment to the plant and anchorage to the roots, but more importantly, it will also retain a very high draining capacity for a longer time or at least till the next repotting. In a well-drained soil, osmosis will take place (flow of water from the soil to the roots) if the soil particles are not too small and spaces between them have adequate medium-sized spores or spaces for water which allow good air movement. If roots are in good contact with the soil, surface tension and capillary action will work hand–in-hand to ensure good water absorption by the roots resulting in the transition of a soaking state of the soil immediately after watering to an almost dryish state upto & before the next watering. Reverse osmosis (flow of water from the roots to the soil) may take place in well-drained soil only if it is allowed to become bone dry for a prolonged period. In the tropics in summer especially, hot weather can dehydrate the plants very fast due to the larger surface area of bonsai pots; on the other hand, in the monsoons, rains are frequent and heavy in most places and there is a strong possibility of water logging in the pots if drainage is not good. The bonsai soil therefore needs to be very well drained with particles of good tensile strength but at the same time it should be able to retain enough moisture during the summer months which is also the major growing season when plants use up an amazingly high amount of water. In Mumbai, India, the soil for bonsai is normally composed of a good proportion of even sized brick crush which is cheaper, locally available and is calcined to a large extent due to kiln firing. River sand is also used whenever available. Other ingredients that are used are cow manure (prone to weeds), vermi-compost (comparatively weed-free), garden earth and leaf mould (Humus). Sometimes coco-peat and vermiculite (expanded mica crush) for moisture retention, rice husk which provides some heat in the soil (in small quantities) and/or crushed coal for making the soil sweeter and other soil additives are used especially for species such as serissa (serissa foetida), wax malpighia (carmona microphylla), indian hawthorn (malpighia coccigera), sandpaper (strebulus asper), etc., which need a little bit of extra moisture in the soil. Lime is added to soils for species like junipers which love alkalinity especially during the winter season to improve needle colour. 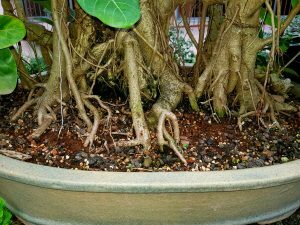 Generally speaking a good bonsai soil for the tropics will have around 50 percent river sand and/or brick crush, 20 percent manure, 20 percent humus and 10 percent common garden earth. The higher percentage of brick crush/ sand ensures good tensile granularity, good drainage in the rains but the soil does not compromise on moisture content due to the addition of manure and humus, which, after their nutritive store is exhausted, retard the breaking down of soil to a great extent. Best results are obtained when all the ingredients are sieved, discarding all powdery stuff and only the granular soil is used. Sieving of all the ingredients prevents break down of the soil to a great extent. 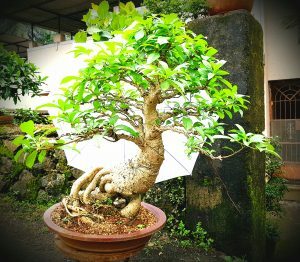 The practice of importing soils such as Akadama and Kanuma from Japan is not prevalent in most of the tropical countries where the species of plants suitable for bonsai are so different from the temperate climates in their requirements that it is not known whether these ingredients will be suitable. As the locally available material is better suited & have already been tested on local flora, are plentiful and are considerably cheaper than imported materials, the need for importing these material is non-existent. However, calcined clay (which is semi-absorbent and of good tensile strength), similar to ‘Turface’ which is available in US & Europe is now being manufactured and is very easily available in different grades and is a comparatively cheap material gaining popularity gradually in India. To sum up, bonsai soil needs to be very well drained for the successful growing of bonsai. Its composition may need to be altered to suit local climatic conditions, plant species (i.e., whether the plant needs more moisture or less, better drainage or normal). Conifers need better drainage and less frequent repotting therefore the proportion of river sand/brick crush is increased. Flowering and fruiting trees need humus rich soil for which leaf mould and coco-peat are added. Some other species need higher moisture; for them vermiculite is added to the soil. In drier areas, a little more compost and vermiculite are added for added moisture and nutrition; on the other hand, in areas of heavy rain-fall, compositions with a higher percentage of river sand or brick crush or both is advisable. 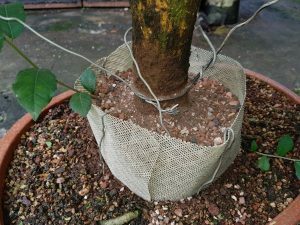 For mame bonsai grown in small pots, vermiculite, coco-peat and leaf mould of about 50 percent is added to brick crush which is preferred over river sand due to the semi-absorbent properties of the former. The particle size also can be smaller than that for bigger bonsai pots. In all sizes of bonsai, however, the key factor is only good drainage; all else is but supportive window dressing. Drainage, drainage and drainage of the Soil! That is the key to successful bonsai growing. Bonsai are grown in small and mostly flat pots which contain a limited amount of soil. Like all living things they need the three elements of water, oxygen and sunlight. This means that they have to be kept mostly outdoors (they can be brought indoors for display for a brief period only) their growing medium or soil should be so suited as to provide anchorage, nourishment and good drainage and they have to be provided regularly with water in order to survive. The actual process of watering bonsai essentially involves the use of a watering can with a fine rose or a pipe hose fitted with a sprinkler attachment with which water is sprinkled on the bonsai in such a way that dust is washed off the foliage and the entire soil is also drenched thoroughly so that eventually excess water flows out of the drainage holes. Most of the books on bonsai and the internet information emanating from Japan and the western countries where the climate is cold and temperate speak of a watering practice which is apparently quite complex. The reason, in the first place, seems to be that due to the cold climate evaporation of moisture from the soil in a bonsai pot would be at a much slower rate than in the tropics where the climate is much more hot. Secondly, coniferous species which are a mainstay of bonsai in colder regions, appear to prefer a state of semi-dryness between consecutive watering, for which reason a specific or fixed frequency of watering cannot be prescribed for them. As there is a major temperature difference in the climatic conditions of temperate and tropical regions as also in the species of plants used for bonsai, watering bonsai in the tropics or watering tropical bonsai in ambient conditions is a different but much simpler prospect. 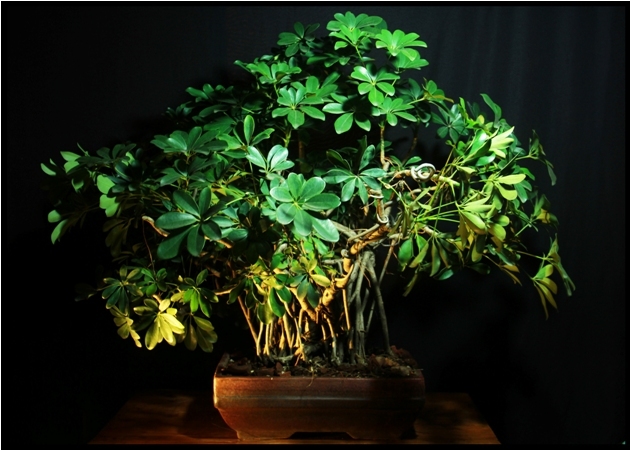 The aquatic needs of tropical region bonsai is much greater than the needs of bonsai from the temperate regions. The guiding principle of watering bonsai in a temperate region on a need-based schedule therefore does not apply to tropical bonsai where, even in winter they need to be watered daily. In the hot tropical summer where the mercury often crosses the 40 degree celsius mark, bonsai need to be watered at least twice daily. In fact, just as bonsai in the temperate regions sometimes need winter protection during freezing amp; frosty temperatures, so also some species with delicate foliage need to be given protection from extreme sunlight in the tropics. Most tropical broad-leaf evergreen species especially ficus and other tropical species thrive on the combination of sunlight, moisture and humidity. This being the case, although a state of semi-dryness between waterings is sometimes tolerated, it is not appreciated. Out and out bone dryness is of course not tolerated in any climate, whether temperate or tropical. Tropical plants also grow much faster than temperate region plants probably because they have three growing seasons per year- the spring, the tropical rainy season and the brief period of heat prior to the onset of winter – as compared to only the spring growing cycle in the temperate regions. Therefore the watering needs of tropical plants in tropical weather is comparatively higher especially during the three growing periods adequate watering in summer. Most species, therefore, need watering twice daily in the summer months in the tropics. Even in the rainy season, a look-out has to be kept on the rainfall and on days when the rains are scanty, watering has to be done manually. 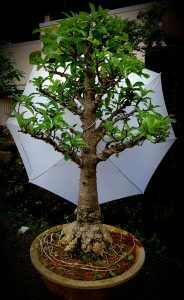 Especially, bonsai with a dense canopy of leaves have to be checked regularly to see that they are watered manually if necessary on days when the rains are not adequate enough. To conclude therefore, care has to be taken to water tropical bonsai on a daily basis throughout the year and twice daily during summere considering the high temperatures and the special need of the broad-leaf evergreens predominant in the tropical bonsai circle. 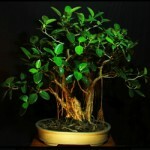 The shaping of a bonsai starts usually only after the trunk of the plant attains some thickness and has some branches. Training can commence even if the plant is in an ordinary pot. 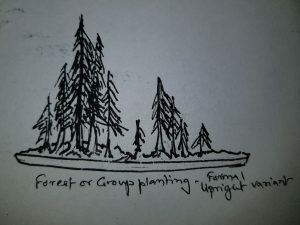 Shaping can be categorized into Formative pruning and Definitive pruning. Before shaping a bonsai study the trees’ individuality; look for interesting features such as movement of the trunk, surface rootage, branch positions amp; development, etc. a) Select as the tree’s front the side that reveals the best features of the trunk such as a curve, lean, etc. Visualize the way the plant may look if its inclination is altered or if its branch positions are altered and also as the plant is rotated round its axis. Find the potting angle and the point from which it looks best and from which its branches are seen spreading in all directions. From this position prune away any obviously undesirable branches and try to bring out and highlight the unique characteristics of the tree such trunk line taper, a shapely curve in the trunk, roughness of bark, etc. b) Keep approximately the bottom third of the plant free of branches. 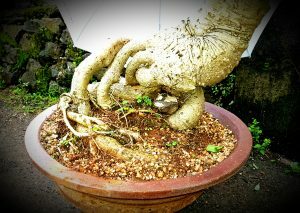 This reveals the structure of the trunk, gives direction to the bonsai and creates an illusion of great age. Choose as the lowest branch (termed as First branch) the longest and thickest one that reaches to the right of left of the selected front. Train it with wire in necessary so that it is inclined slightly forward. d) To offset the first branch, select a branch positioned slightly higher than the back branch but on the opposite side of the first branch (termed as Second branch) and if necessary train it with wire so that it too sweeps forward. Both the first and second branch taken together would then seem to be welcoming the viewer. 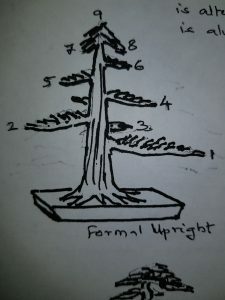 e) The first three branches generally establish the branch structure of a bonsai; the other branches following the inclination of the first branch, all branches creating a spiral of higher, thinner and shorter branches, although if seen from above, no branch emerges from the same degree of the compass along the trunk line and that no branch overlaps another. Once the plant is pruned initially for basic shape (formative pruning), it should be allowed to develop further by growing for a season or two so that it regains its strength before commencing with pruning to define the shape of the branches and tree (definitive pruning). While pruning to define the shape, most of the cuts are made just above a leaf which is pointing in the outward and downward direction; the aim of definitive pruning is to achieve a larger and downward inclined spread of the branches. Only such a spread will project the image of an older, more mature tree and define its silhouette. Pruning in this way results in growth of buds that point in the outward and downward direction as the thrust of growth goes immediately into the lateral shoots just below the cut. This will also avoid ingrowth which is likely to look unsightly and will also avoid overcrowding and eventual dieback of inward growing shoots due to lack of sunlight. The process of pruning is repeated when sufficient more growth is achieved when it is semi-lignified and the shoots extend to about six/eight leaves. Growth is likely to start from a number of the leaf axils below the cut and with repeated pruning over a few more seasons the branches divide and sub-divide over and over again into a ramified structure. (Tip: Branches may sometimes have to be thinned out if ramification reaches a stage where further division may so overcrowd the leaf structure that sunlight does not reach to inner shoots resulting in widespread dieback. Removal of dead shoots/branches may also be necessary at some point of time). 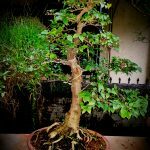 The major factor in the directing of bonsai growth is pruning not just of the branches but, even more importantly, of the roots. Even after the tree has reached its designated size and shape it has to be periodically unpotted, root pruned and repotted with fresh soil. Thus, the tree stays the same size and remains healthy through the rejuvenation of the root system. At one stage or the other, every bonsai which has been in the same pot for a long time will be required to be repotted just as any potential bonsai will be required to be potted into a shallow, flat ceramic bonsai container for aesthetic purpose. Flat containers represent earth and are therefore desirable if a plant is to look like a bonsai tree. The pot for bonsai is like a frame to a picture. The pot should complement the tree and not detract from its looks. It should therefore not be too ornate or shiny. 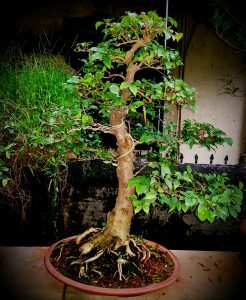 It should also be in proportion to the bonsai – not too big otherwise the tree will look comparatively smaller and will not give the impression of a big tree no matter how good it is, nor should it be so small that it will look visually unbalanced when compared to the bonsai. a) A suitable bonsai pot is chosen for the tree which is to be potted. The pot should neither be too big nor too small but should be big enough to accommodate the root ball and look appropriately balanced considering the future growth of the tree. b) The pot is prepared by fixing pieces of netting on the drainage holes with the help of wire. If the tree is to be transported to another place after potting or if it is very tall or heavy and is liable to be shaken by strong winds or if it is feared that the rootage is inadequate, the tree will need to be tied into the pot. For this, insert a length of aluminum wire through the drainage holes so that the ends of the wire stick out of the pot from above. A small quantity of bonsai soil is poured on to the base of the pot and mounded where the tree is likely to be placed. c) The tree which is to be transplanted in the bonsai pot is first wired if necessary. It is then taken out of the nursery pot in which it is and the soil from the periphery of the root ball is loosened bit by bit. Tangled roots, heavy roots and dead or rotted roots are trimmed off leaving a healthy, fleshy and compact root ball intact. Depending on the species, not more than about one-third to one half of the roots are trimmed off. 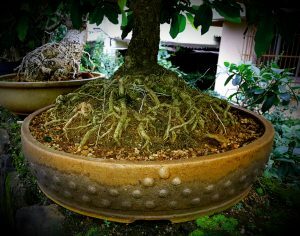 The base of the root ball is also reduced, if necessary and the root ball is tried for fit in the pre-chosen bonsai pot. d) Set the root pruned tree in the pot spreading the roots over the mound of soil and rock the tree gently so that the tree settles comfortably. Put Cover the roots with more soil and using a blunt instrument like a chopstick or dibber, poke the soil working it gently into the nooks and crannies between the roots but not in the compact root ball. Stop poking when the tree stops rocking if gently pushed and it appears to be stable. Pour more soil so as to cover any hanging roots and tamp the sides of the pot with the hand to settle the soil. The soil level near the edges of the container should be slightly below the rim of the pot. e) Set the pot in a basin full of water which reaches just below the rim of the pot. Water will rise by capillary action and moisten the soil. Also spray the foliage of the tree with clean water to wash off any dust and also to provide it with extra humidity. f) Remove the pot from the basin of water after about 15 minutes and set it in a shady place where it will get partial sunlight, away from winds and direct sun. Gradually, after about a fortnight when new growth is evident, expose the tree to more sunlight in increasing stages. g) The success of the survival of the newly potted bonsai is in not watering it after the first watering till the soil is just dryish damp. Instead spray the foliage at frequent intervals to conserve moisture. A good alternative would be to provide the tree with a misty micro-climate in a green house or under a closed plastic covering with just enough ventilation to prevent saturation. Repotting is similar to potting except that in repotting a tree is transplanted from a smaller bonsai pot to a larger pot or sometimes into the same or similar sized pot. (Tip: Conifers are difficult to transplant in the tropical climates so it is better not to disturb their root balls at all and transplant them in a cooler season or in the rains). A bonsai is distinct from other plants mainly by virtue of its tree-like shape and appearance. It should firstly have the common attributes of its bigger counterparts in nature. 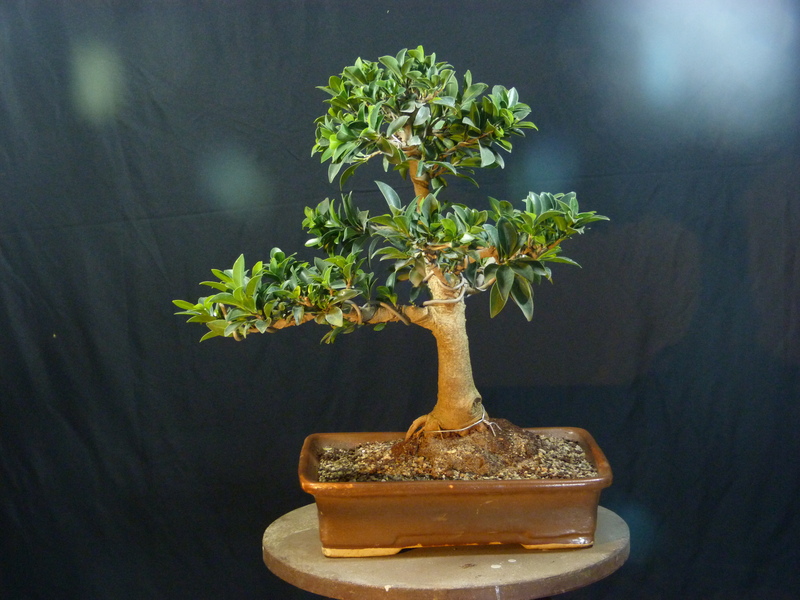 Bonsai are differentiated from ordinarily potted plants because to all intents and purposes they look like full grown trees, albeit on a miniature scale. But to look like a tree, a bonsai should have the following characteristics of a tree –1) it should have a tapering trunk line;2) an abundance of branches reaching out in all directions; 3) a good spread of roots emerging from the base at the level of the soil disappearing into the soil gradually so as to denote stability and agedness; 4) a tree as natural looking as possible with reference to its species; and 5) a pot which is in aesthetic and visual proportion to the tree, neither too big nor too small, both together forming a harmonious unity. the third branch again from the side of the trunk opposite the second branch; a branch growing from the back of the trunk away from the front (somewhere between the first and third branches) to give a third dimension to the tree. All other branches would then follow this pattern each emerging from a higher point on the trunk, the entire branch arrangement rising in a gentle spiral up the trunk. The branches, as they emerge from the trunk should reduce in thickness, length and development from the lowest to the topmost branch. All the attributes mentioned above are equally applicable to bonsai created from plant species from the temperate as well as the tropical climates. However, most tropical plant species, because they have virtually three seasons per year to grow in, have a somewhat faster rate of growth then the temperate plant species which, in comparison, have only one growing season per year, Consequently, tropical plants most times do not have a triangular outline but have a more rounded appearance, with the branch lengths somewhat more extended than temperate climate trees, particularly the ficus family which also feature aerial roots which enhance the appearance of branch spread. The style classification is therefore not as rigid as they are for temperate plants. Branches should not cross each other. They should not face in the direction of the front, i.e., the best viewing side of the bonsai. Branches should not emerge from opposite sides of the trunk from exactly the same point on the trunk (called Bar branches). Taper should be uniform, i.e., there should not be any reverse taper. Extreme distortion of trunk or branches is deemed to be unnatural and therefore avoided.